A terrible chapter began in the lives of our sheep in the summer of 2007 when packs of coyotes began attacking our lambs. Although our livestock guardian dog could handle a single coyote without any trouble, a pack was understandably impossible for him. Within a week, six of our ten lambs born that spring had been eaten. In desperation, at the end of August, someone began sleeping in the pasture every night. Luckily, fall came late that year, and when we were finally forced inside in mid-October, the coyotes had moved on. A few months later, they returned and ate another lamb. Then in summer 2008, they ate a yearling lamb and a four-year-old ewe. The sheep were a nervous wreck, and we weren’t in much better shape. Someone again began sleeping in the pasture, and I began searching for additional livestock guardians. 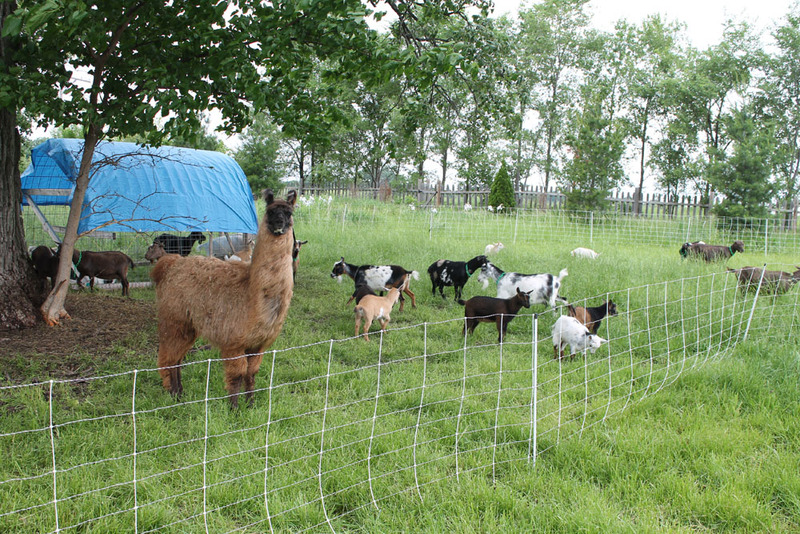 Dogs, donkeys, and llamas are the typical livestock guardian animals, but which one would be best for our situation? A puppy would not be a good guardian for a whole year, and an adult dog would be more challenging for our current dog to accept. We’d had a donkey before, and he was mean. He’d trampled and killed one of our ewes, so we weren’t excited about another donkey. Llamas seemed like the best choice, so I started contacting llama breeders. I really had my doubts that llamas would be able to handle our problem, and I was completely honest about what kind of job they’d have here on Antiquity Oaks when I contacted breeders. I honestly felt like I was sentencing them to death (and wasting my money) by bringing them here. I was able to find four adults: two geldings in their teens and two yearling, intact males. Within a week, they were delivered to the farm. 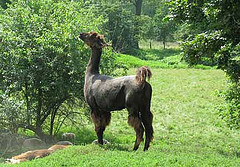 Every morning when I went out to the pasture, I prepared myself for the worst, expecting to see a dead llama out there. But it didn’t happen. 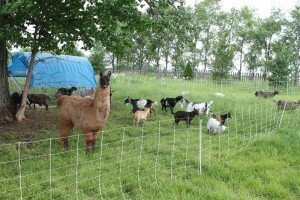 A week after the llamas arrived, my son called me out to the sheep pasture. Teddy, our herd sire, had been attacked. A coyote had ripped a four-inch by six-inch piece of skin off his rear leg, but he was otherwise unharmed. He was the first sheep to ever survive an attack! 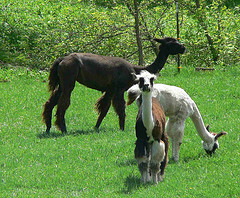 Obviously, the llamas had stopped the attack and chased off the coyotes! Within that first year, they also stopped at least three additional attacks, including two attacks on turkey hens. Who knows how many they chased off before the coyote had a chance to attack? The llamas won a place in our hearts, and we started talking about getting a female so we could breed our own replacement guardians, and in 2009, Katydid, our first female, came to live here. A year later, we added another female named Sitara. Over the next few years, they had babies, and our herd increased in size. 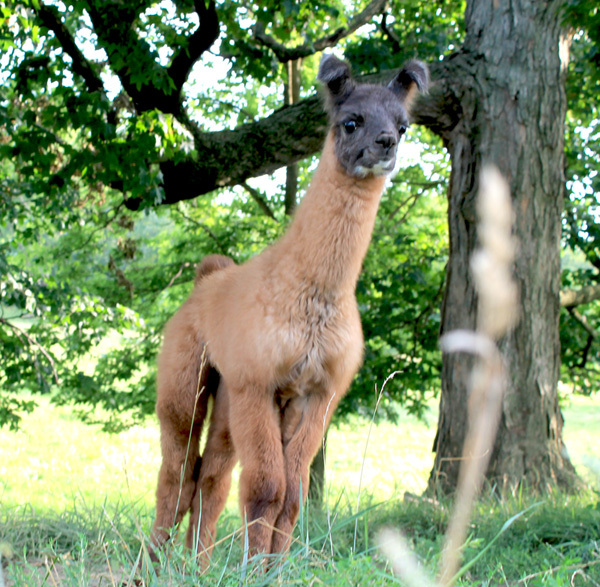 Unfortunately, in 2013, we started having problems with meningeal worm, which is transmitted by white tail deer, and all of our llamas died over the next two years. To learn more about meningeal worm, click here.